Doodle Sky Pro is an interesting plane shooter where you you guide a line for your plane to follow. This is an app for the iPhone, iPod touch, and iPad and was released by Original Force Games. The graphics are really good in this game. Including the standard crumpled graph paper look that’s popular these days, Doodle Sky has added buildings, geographical elements like beaches or islands. The background has varying colors and design so it’s really nice to look at. The planes look like paper cut outs of children’s drawings. It’s a really charming effect making the planes actually look pretty cool. Explosions are nice and cartoony, the enemies are bright and some turrets remind me of tower defense units, so that’s a plus in my book. Music is epic yet the song is set on repeat for the majority of the game. Luckily, it isn’t a grating score, so it sets the mood and doesn’t annoy too much. The rest of the sounds involve gun fire, exploding planes, and the dropping of bombs. Movement involves drawing lines from your plane to the field. The basic goal is to guide your plane through finger movements so that the front end of the plane is right on the enemy and let the plane autofire onto the enemy. There isn’t any real control past that. The default plane has terrible speed with bad turning, so beware when you pass the 3rd-4th level, but there are lots of unlockable planes with FAR better speed to make the travel less frustrating. Interface seems to be inconsistent at times. For the tutorial an arrow implies there is more to read. Pressing the arrow does nothing and my first instincts was that they were either broken or just not meant to be pressed, but I found out that you have to swipe it. Another example of inconvenient layouts is that sometimes the OpenFeint ‘you have a new highscore’ display will block the start button, which means you have to wait a second before you can hit the start button to start a new mission. The text in the mission description is difficult to read. It feels like the game is taking the controls out of the players’ hands. You don’t have direct control over when or where your plane fires its gun. Instead the CPU auto fires when something is right in front of the plane. You don’t get to use the bomb on command; you have to wait for the plane to flash the bomb symbol on itself in order to use it, which feels odd. Sometimes, your path is taken as more of a suggestion for the plane rather than an outright command, which feels odd. Luckily the enemy isn’t too difficult to pindown. 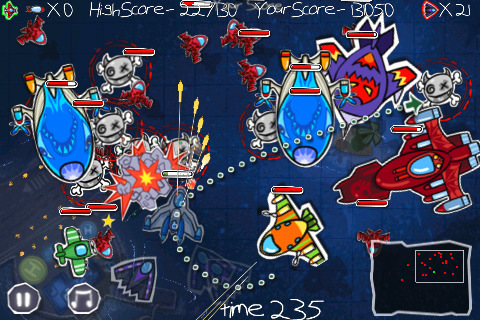 Overall, the really good use of the Doodle theme, the charmingly bright and colorful planes, and nice music are all offset by the less developed enemies in the game. Despite some flaws there are some definite pluses in this app. 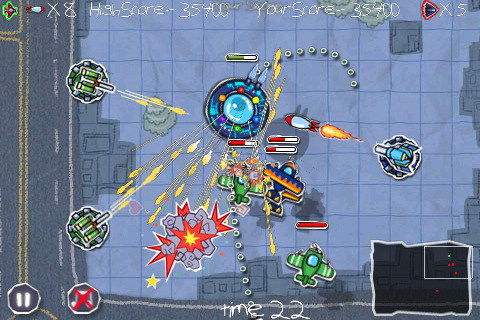 Doodle Sky Pro is one of the few “Doodle” games that actually uses the theme well and makes it visually appealing. AppSafari review of Doodle Sky Pro was written by Joseph Ho on August 23rd, 2010 and categorized under Action, App Store, Games. Page viewed 4002 times, 1 so far today. Need help on using these apps? Please read the Help Page.